Floormaster has been serving San Diego County’s floor cleaning needs since 1981. We are a Better Business Bureau member in good standing with an A+ rating. We provide residential and commercial floor cleaning and can custom tailor a professional finish to any particular condition that you may encounter. 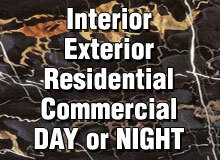 We work with all types of surfaces and no job is too big or too small. We offer one-time cleanings or scheduled maintenance. We pride ourselves on being on time and completely prepared. Floormaster is bonded and insured so you can relax and let our experts bring your floors back to life. We use state of the art equipment and have the ability and expertise to solve any type of problem flooring. We use environmentally safe procedures and products. We have developed a premier residential floor cleaning product that utilizes vegetable-based enzymes that provide a streak-free finish. Our floor cleaner neutralizer is completely safe and non-toxic. We work with home owners, contractors, property managers, interior designers, real estate agents and hotel and commercial properties. All of Floormaster’s technicians are uniformed and have expert knowledge and experience. We are available 7 days a week with 24 hour service. Look through our gallery of pictures to see the quality of expert cleaning and refinishing we provide. We have references and testimonials available at your request.